Mode of Trekking / Climb : On camping basis. Trekking Grade : Adventurous & Challenging. Trip Duration : 27 Days. I Love Trekking Nepal Offers a grand journey to Rolwaling and Tashi Labtsa were once closed to western trekkers, now it is opened to trekkers from the 90's with an extra special fee. It's one of the most outstanding high alpine valley treks, in the north east of Nepal, the trek starts from the busy bazaar of Barabise on the main highway to Tibet. From here, on leaving the civilization behind and enter the high alpine valleys of Rowling off the beaten trail sparsely populated area, near the Tibetan border on the southern flank of the giant Mt. Gauri Shankar. Our Trekking leads towards the ridges rounding the scenic high passes and ascending gradually into the lovely upper part of this beautiful valley through the mist filled rhododendron, magnolia and oaks forest. Trek through traditional unspoiled Sherpas villages, farm-fields under the shade of the towering giant Mt. Gauri Shankar and Meluangtse straddling the border with Tibet, the treks leads to the last Sherpa village at Beding a large settlement in the Rolwaling region, situated in a narrow gorge. This trekking continues further east to cross one of the most challenging pass Tashi Labtsa (5755m), after the strenuous climb, with a climb of Parchamo 6,187m. Parchemo seen from the pass the peak is an attractive and straightforward climb to this snow peak with a well defined north by north west ridge the face forms a uniform snow slope broken by crevasse and small seracs rising from the rocky lower buttresses above the Drolamb Glacier after the great climb to the summit, return journey with a steep descent with a pleasant walk up to the village of Thame at Khumbu area. At Thame, the old trade route over the Nangpa La into Tibet branches north following another Bhote Koshi. Day 01: Arrive in Kathmandu over night. Day 03: Drive to Barabise. Day 04: Trek to Dolangsa. Day 05: Trek uphill & camp at Tinsang. Day 06: Trek to Bigu Gompa & camp. Day 07: Trek to Chilangka. Day 08: Trek to Bulung. 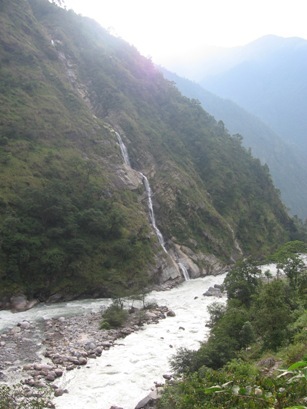 Day 09: Trek to Gongar. Day 10: Trek to Simigaon. Day 11: Trek to Dovan. Day 12: Trek to Beding. Day 13: Rest day for acclimatization and a short hike. Day 14: Trek to Nah. Day 15: Trek to Glacier camp. Day 16: Trek and climb to Tesi Lapcha. Day 17: Rest day (Climbing preparation). Day 18: Ascent of Parchamo and return to base camp. Day 19: Climb to Tashi Labtsa & camp on the pass. Day 20: Trek to Thengpo. Day 21: Trek to Thame. Day 22: Trek to Namche Bazaar. Day 23: Trek to Phakding. Day 24: Trek to Lukla. Day 27: Transfer to TIA.